Cast and crew members flew into Kerry Airport yesterday on a private jet. STAR WARS FILMING is starting on Skellig Michael this morning. 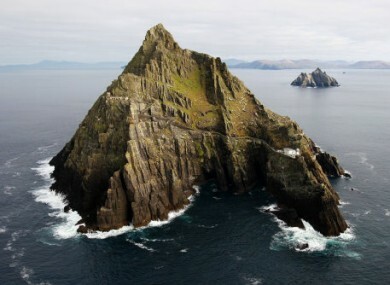 The island, 12 kilometers off the coast of south Kerry, is being used in the opening scenes of Star Wars Episode VIII. Skellig Micheal is the largest of the Skelling Islands and was the site of monastic settlements for hundreds of years before the 12th century. However, Arts Minster Heather Humphreys said those opposed to the filming on environmental grounds are wrong. Humhpreys said that an ecologist and specialist departmental staff will be present for the duration of the filming and will have the authority to stop or modify filming at any point, should any concerns arise. Permission was granted to Disney-owned Lucasfilm to return to the island to film last week. I Just visited #SkelligMichael - Everyone in Co. Kerry is so excited for the upcoming @StarWars7Movie ... Now I can't wait either. The makers of ‘The Force Awakens’ are expected to film again for two to four days. The island will be closed to the public during filming. Email “Skellig Michael closed to public as Star Wars filming begins ”. Feedback on “Skellig Michael closed to public as Star Wars filming begins ”.